Computers are great when they are fast, but unfortunately they don't always stay fast. Most PCs slow down over time and that's when they become a pain in the neck. Luckily, it's not too hard to speed up a slow computer. Follow these three steps and your PC will soon be as good as new. The first thing you should do is scan your PC for viruses and malware. A lot of malicious programs transmit data over the Internet, making your computer slow. So, if your PC becomes really sluggish all of a sudden, you should update your security software and run a scan as soon as possible. Deleting the virus will not only return PC speed back to normal, but it will also protect you from things like identity theft. When you are sure that your computer is virus-free, you should run disk cleanup to free up as much space as you can. When your hard drive is cluttered, Windows needs a lot more time to do simple things like opening files and programs, launching your Web browser, and so on. 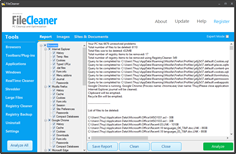 You can either use the built-in Disk Cleanup utility by going to Programs - Accessories - System Tools - Disk Cleanup, or use a more advanced disk cleaner like FileCleaner that will not only perform basic cleanup, but will work in real-time in the background to prevent junk files from accumulating. When you are done with disk cleanup, move on to registry cleanup and repair. The registry is the central database of any Windows operating system and it's responsible for every single thing that happens on your computer. When you open a file, a registry entry is created. When you move a file to a different folder, the registry is updated. Even when you switch on your computer, new information is added to the registry. Unfortunately, only too often the registry accumulates corrupted and obsolete entries. And that's when your computer starts slowing down. In really extreme cases you may experience PC freeze-ups and even crashes. Repairing the registry with a trusted registry cleaner will make your computer faster and more stable. Now you know how to speed up your computer in a quick and easy way. Remember to run all these tasks on a regular basis and your PC will never slow down to a crawl again.